Where would Southern Rock be with Lynyrd Skynyrd? Hard to say. The bigger question is, Where would the band have been without Leonard Skinner, the man who inspired their name? Sadly, Skinner passed away in his sleep in North Florida at the age of 77. Leonard Skinner, a gym teacher and coach at the Robert E Lee High School in Jacksonville, Florida in the late '60s, was a by-the-books sort who had zero tolerance for students disregarding the school's policy against males having long hair. Coach Skinner sent numerous students to the principal's office for violating dress code rules, two of them being aspiring musicians Gary Rossington and Ronnie Van Zant. Van Zant, who was later suspended from the school, decided to get back at Skinner by changing the name of his fledgling rock band One Percent to Lynyrd Skynyrd. 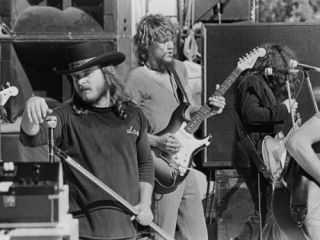 Lynyrd Skynyrd went on the multi-platinum success in the '70s with hits such as Sweet Home Alabama and Free Bird before an October 1977 plane crash in Mississippi killed Van Zant; guitarist Steve Gaines; Gaines's sister, vocalist Cassie Gaines; an assistant road manager; and the pilot and copilot. Surprisingly, Skinner bore no ill will towards the band who mangled and immortalized his name. In fact, he even gave the group permission to use a picture of his Leonard Skinner Realty sign in the sleeve of their third album, 1975's Nuthin' Fancy - a move which endeared him to Lynyrd Skynyrd fans. The band announced his death on their website: "Coach Skinner had such a profound impact on our youth that ultimately led us to naming the band, which you know as Lynyrd Skynyrd, after him," wrote Gary Rossington. "Looking back, I cannot imagine it any other way. Our thoughts and prayers are with his family at this time."